Ashley is a single-player minigame hosted by Ashley and Red in Game & Wario. The level theme songs are collectively titled Ashley's Star Revolution and feature arrangements of parts of Ashley's Theme in WarioWare: Touched! At her mansion, Ashley reads a book and eventually comes across a page depicting monsters and a surreal landscape. The illustration catch her interest and she decides to cast a spell to be materialized inside the book page. However, as she performs it, a gust of wind turns the book to a page depicting desserts. Ashley and Red are then transported inside the dessert-themed page. Red is pleased by this development, but a furious Ashley orders him to transform into a broom in order to escape the dessert world. The game is a horizontally-scrolling shoot 'em up. Movement is controlled by angling the upward and downward. The objective is to progress through the levels while collecting purple magic orbs and presents, and shooting floating pastries with magic blasts. Collecting items give points, and collecting items without missing any increases the score multiplier. 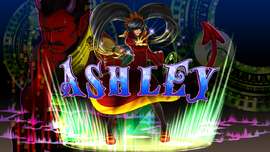 In addition to shooting magic blasts, Ashley can collect spell orbs, which when activated, destroy every enemy on-screen and collect any item present. A certain number of points is needed in order to get "Best Buddy" ("Best Assistant" in the PAL localization) status after completing a level which rewards a coin for the Cluck-A-Pop if accomplished for the first time per level. Ashley can be hit an unlimited number of times, but being hit substracts points. If she is hit too many times in a row, poked three times via the screen or if too many loops are performed in a close timeframe, the scrolling stops and the player will have to pat her on the head via the GamePad's screen in order to continue. Points will be removed at a rate of 1 per second. If the score reaches 0 points, the game ends. Ashley gets progressively angrier during these sequences. If it is the third time she needs to be comforted and the player fails to calm her quickly enough, she will shoot the screen, resulting in an automatic Game Over. At certain points, the player is prompted to select between two paths. There are three stages in total, each of which conclude with a boss battle. Once the player has cleared the game, stars are added to the levels. : Activate spell power/ pat Ashley on the head/ select path (when prompted). "I'm Ashley. Join me and Red on a side-scrolling nightmare of seriously sickening sweetness." In the opening cutscene, an Onion from the Rhythm Heaven series is on the rightmost stack of books. If the player blows into the microphone on the , a gust of wind will blow into Ashley's dress. She then quickly holds it down and glares at the screen with an annoyed groan. This page was last edited on March 30, 2019, at 12:28.